The Arris TG1682 is a DOCSIS 3.0 device offering 24x8 channel bonding. RESET - Use this button in the unlikely event that you want to restore the default factory settings. This button is recessed to prevent accidental resets of your WiFi modem. 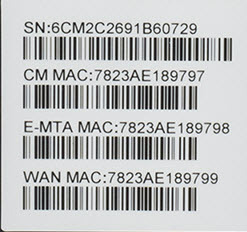 MoCA - indicates connectivity between the Telephony Gateway and other home devices connected via the MoCA network. Power - Connects the modem to the power adapter. A Wireless Protected Setup (WPS) button is located at the top. 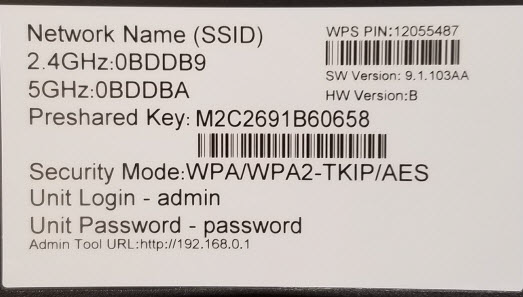 WPS allows you to add wireless devices to the wireless network. Solid None - Device is powered on. Slow Flashing Scanning downstream - Verify all cable connections and try resetting the modem. Solid None - Connected to the Internet. Off Internet is not available - Verify all cable connections and try resetting the modem. Solid None - Internet is available. Solid None - 2.4 GHz WiFi frequency is enabled. Flashing None - Activity with connected device. Off WiFi is disabled - Update the wireless LAN settings in the Configuration Interace. Solid None - 5 GHz WiFi frequency is enabled. Off WiFi is disabled - Update the wireless LAN settings in the Configuration Interface. Solid None - Indicates service is enabled. Flashing None - Line 1 or Line 2 is in use. Note: Refer to this light only if a battery is installed. Cox does not provide the battery with this device. On None - Battery good or low. MoCA Off None - This function is not available. For more detailed technical information on the TG1682, use the resources below.